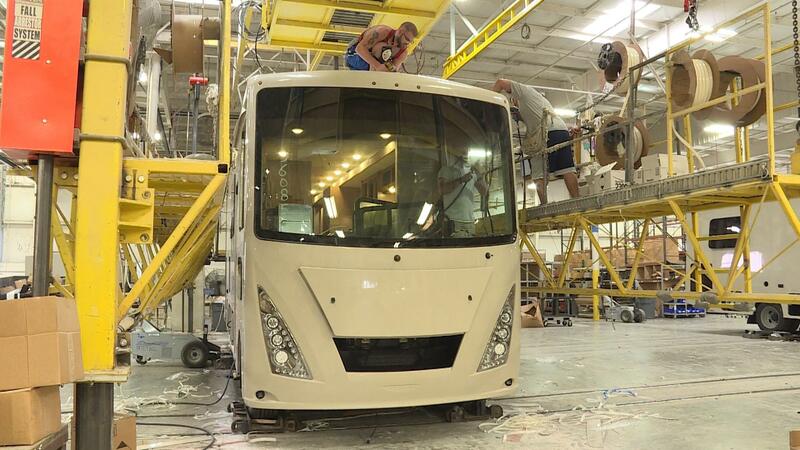 Workers assemble a new RV at Thor Motor Coach's Plant 750 in Elkhart. In one of Thor Motor Coach's largest factories in Elkhart, dozens of RVs are waiting to be assembled. Some are just bare frames; others only need their TVs and countertops installed. "So here you can see the motorhome starting to take shape," says marketing director Wes Bogan as he moves down the assembly line. 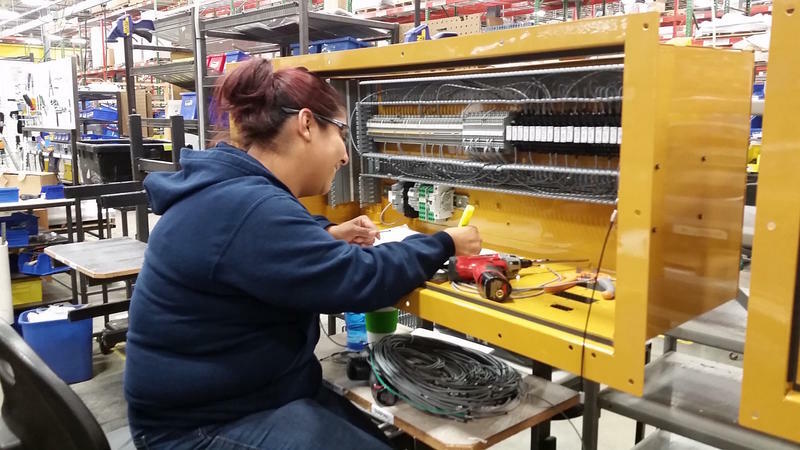 "We've installed the side walls, so those are going in…"
Bogan says almost all the components are being made by hand -- there's none of the automation you see in some modern factories. "The human factor is something that, with the processes that we have in place, is still the best way to go," he says. But finding the humans to carry out those processes hasn't been easy lately. The RV industry and its home base of Elkhart are rebounding from the 2008 financial crisis. Now, RVs are in even greater demand than they were before the recession -- Thor alone posted a record $4 billion in sales last year. "If a company doesn't build the entire unit, they make the steering wheel." Eighty percent of all RVs sold are made here. And the industry needs more workers than it's been able to find. But some training initiatives have fallen flat. Ivy Tech Community College recently shut down a pilot training program in RV manufacturing -- it didn't enroll enough students. That's a problem for Elkhart Mayor Tim Neese, who says a company town is only as good as its workforce. "If a company doesn't build the entire unit, they make the steering wheel, or they make some of the components, or they make the molding that goes around the windows," he says. "So it's all very connected." Neese, who took office this year, wants to preserve the business they have -- but he's got some other irons in the fire that would soften the impact of another recession. They include new housing, a major oncology hospital and a launch pad for new start-ups. Elkhart Chamber of Commerce CEO Kyle Hannon says almost 20 percent of the local labor force commutes in from somewhere else. He'd like that to change. 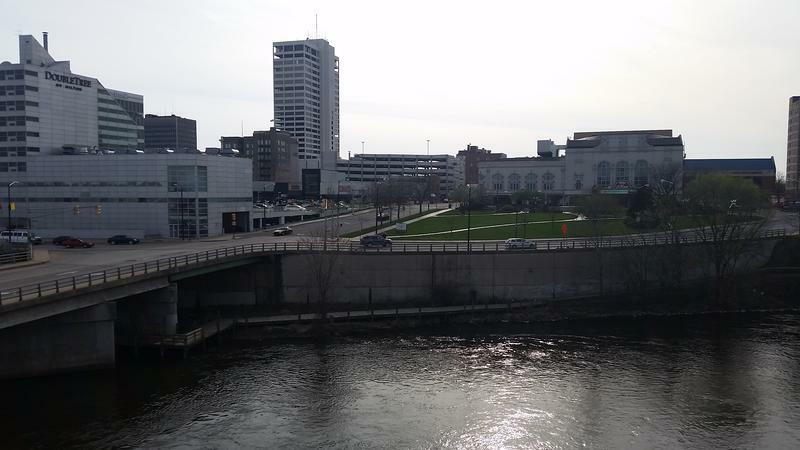 Where are Elkhart workers coming from? Click on a county above to see how much of Elkhart's workforce it supplies. "We need to up our game from the livability standpoint," Hannon says. "It will be harder to keep the business creators and the upper management in the community if they don't have a place to live and a place to enjoy." But Elkhart County has 150,000 open jobs right now -- and only 104,000 people to fill them, according to census data. So Hannon says finding those workers is their priority. Mark Dobson, with the county economic development corporation, agrees. "We talk about the importance of diversity. We also talk about how important it is to remember who we took to the prom," he says, laughing. "And you know, we took the prettiest girl to the prom, and we don't want to abandon her on the dance floor. So we really work hard at both." 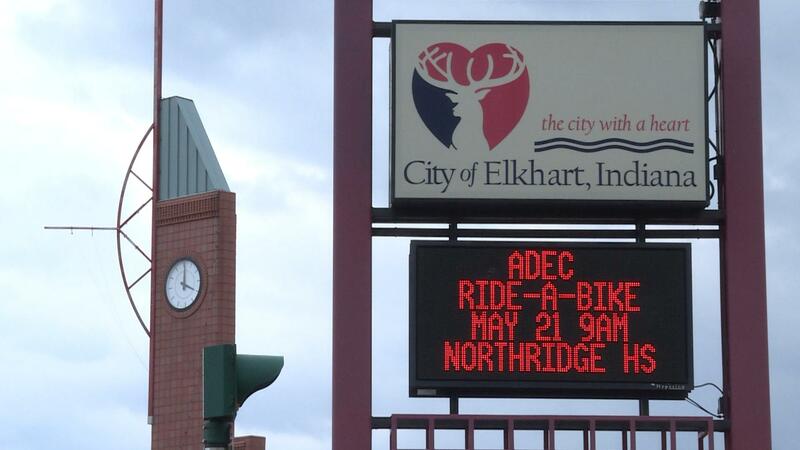 A sign lists community events off Elkhart's Main Street. That means marketing the RV jobs around the country with social media and even billboards. Dobson says they're starting to see some return on those -- and it can't come soon enough. He worries that eventually, companies will move somewhere else where people want the work. Elkhart's RV companies have added facilities in other states -- but at this point, they're also still expanding here. Back at Thor, CEO Bob Martin is showing off the comfy interior of a mid-price Hurricane model Thor RV -- two TVs (plus one outside), a full kitchen and room for seven people to sleep. Martin says they can patch their labor gap with more capacity and more overtime, and in-house training for new workers. Those workers will need to learn to build systems like the "slide rooms" that let the RV expand when it's parked and shrink when it's on the move. "I'd rather have these problems than any other problems." "It says retract, so…" Martin pushes a button beside the RV's bedroom door, and the mechanism whirs to life, pulling in the side of the RV far enough to make it driveable. "I can safely stand right here, and it comes in about 18 inches." It's all part of the RV lifestyle, which Martin says hasn't changed much -- despite some ups and downs. "I lived through the recession. Just watching the industry really just slow down and watching the city just become quiet was -- it was a scary time," he says. "And to see it come back relatively quickly... I'd rather have these problems than any other problems." 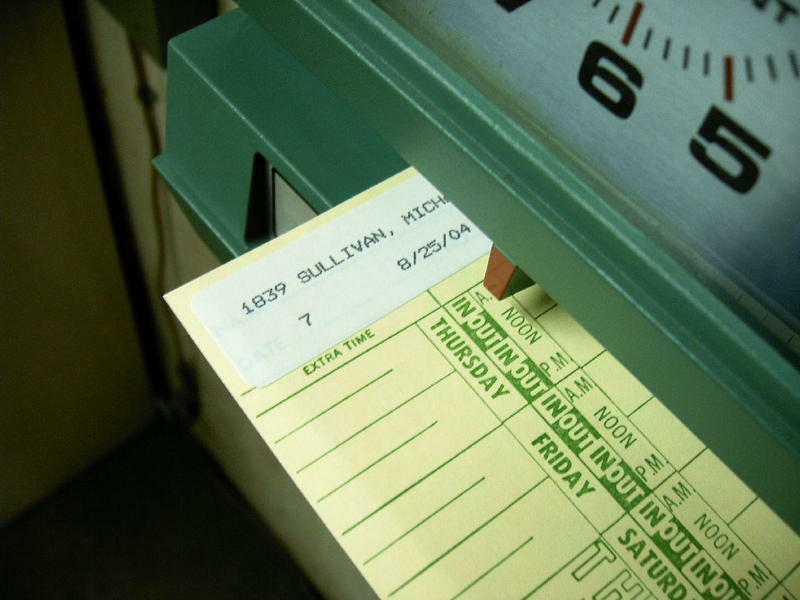 The final changes to federal overtime pay law are out this week. Businesses in Indiana and nationwide now have until December to figure out which of their workers can start earning OT -- and how to pay for it. Under the final version of the rules, salaried employees making less than $47,476 a year will earn time and a half for working overtime. It's twice the old threshold -- and it could cost the most for Indiana trades like retail, manufacturing and education, says Indianapolis-based compensation consultant Julie Bingham.